Most of the bra’s I make have interfacing. Below is my default bra that I have made in a lot of variations. These are my latest additions to the lingerie drawer. 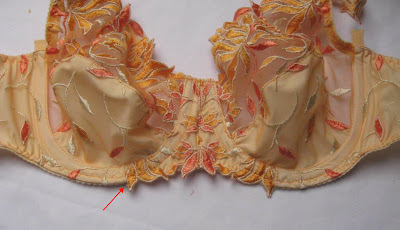 Pin right side of lace to right side of the under cup. Pin the non stretch interfacing layer on top of the lace. The lace is now sandwiched between the under cup lycra and the interfacing. 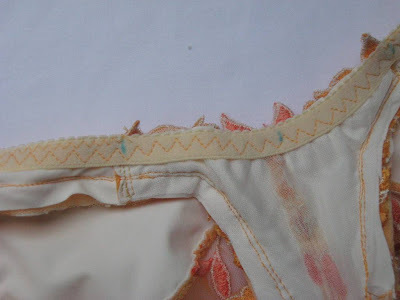 Sew the seam with a straight stitch. Turn to the right side and edgestitch the under cup. 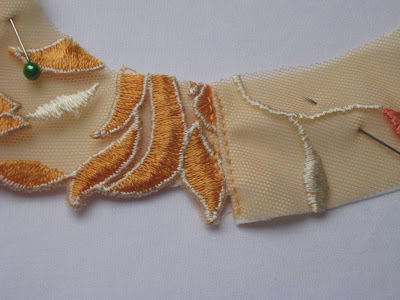 I use the invisible hem foot for this with the needle position to the left. While doing this I make sure that the lycra and interfacing are folded down properly. I do this by tugging it a bit with my fingers, I don’t use pins. 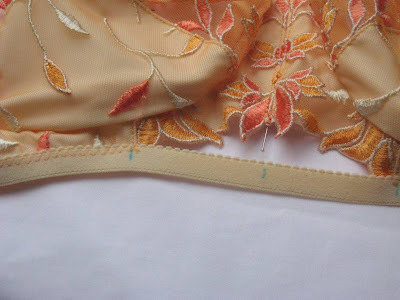 For this bra on which I’m working now I then stretched the lcyra a bit over the interfacing as described in this post. The extra is still on the cup and has to be trimmed. The side cup I sew in the same way. A post to be able to claim this blog with Bloglovin (which I don't understand, but that's just the way it is). I've owned a bra with a build-in bra a long time ago and worn it till it almost fell apart. I haven't owned or found a well fitting swimsuit since (at least not in a price range I'm willing to pay). As I'm not much of a sunbather or swimmer, not too much of a problem, but I would like to try this sometime. This is a way to make narrow straps from lycra that some designers use often in their lingerie. 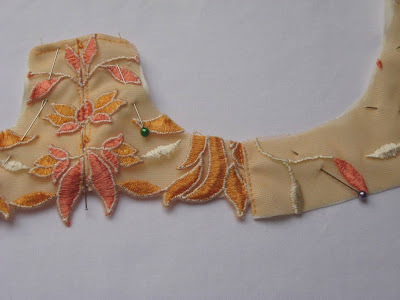 This technique can be used for other fabrics as well. 1 Cut a piece of lycra about 4 cm wide (1.5 inch). Cut the length you need plus a bit extra. Stitch with a stitch with a little stretch (narrow zigzag, triple straight stitch), use the edge of your foot as a guide. You can use the needle position to adapt the width of the strap a bit. 2 Trim the seam allowance. You trim of more than you started with, but if you start with a very narrow piece of fabric, it will not be transported properly by the feet dogs. 3 Turn the strap, I use a strap turner. 4 Example of how a strap can be used. 5 If you don’t want stretch in the strap, you can add strip of non-stretch tule. 6 When turning the strap it will be inside the strap. 7 The result. The upper one is the one with a strip of tule. It’s a bit thicker and has less tendency to curl. A few inspiration bra’s from rtw, pictures are from the internet, the designer is Marlies Dekkers.